My homily at the 5:00 Mass at Holy Ghost Church on Sunday, June 17, 2018. Today’s readings speak of God’s desire to make good things start small and grow over time. Bishop Robert Barron calls this the Mustard Seed Principle. It’s the idea that while God could just establish something big right away – after all He’s God and he can do anything – he prefers to start small and enlist our cooperation so that the good thing grows over time. God plants the seed in our hearts, we water and feed that seed with our efforts, and he causes it to grow. I’ve experienced Mustard Seed Principle at work in my life so I know from first-hand experience that it’s a valid spiritual law. Our monthly Bridge Ministry where we feed the homeless just up the street at KARM is a great example. Many of you have heard this story before. Just two and half years ago on Christmas Day, Christine and I decided to make peanut butter and jelly sandwiches and coffee down under the interstate on North Broadway where many of Knoxville’s homeless population live on the street. We were touched by the experience and felt as though God was calling us to continue this ministry. In January I shared our experience with the Knights of Columbus and we soon had a couple of dozen volunteers involved. We’d meet at the Knights’ Hall monthly to make the sandwiches as a group and bring them downtown to distribute them once a month. Over time this ministry has grown to where we now serve nearly 500 hot dogs, chips, cookies, ice cream, coffee and lemonade once a month from the KARM courtyard. This is the Mustard Seed Principle at work. Dear friends, each one of us can experience the Mustard Seed Principle at work in our own lives by making just the smallest effort to grow closer to God. While you may not be called to establish a ministry or some other large undertaking, we are each being called to greater personal holiness. This involves our ACTIVE participation in God’s plan for our lives and a desire to become a Saint, regardless of our personal circumstances. Just as we know that we need physical food and drink to sustain our bodies, we also need spiritual food and drink to sustain our souls. God wants us to grow closer to Him, but we have to be willing participants in that growth. We have to make an effort to eat good spiritual food, and to eat it regularly. If we do our part, God will do the heavy lifting for us. So, just what can we do to ensure that we are adequately feeding and hydrating our souls in cooperation with God’s plan for our lives? The first thing is to PRAY. Pray EVERY DAY. In our busy lifestyles our daily spiritual nourishment will come primarily from a faithful prayer life. We must pray often and everywhere. We must set aside time to pray each and every day of the week. No matter where we are, no matter what is going on in our lives, we can all find time to pray every day. I suggest that you find a good daily devotional and pray the prayers. Talk to God, ask him for help with whatever is going on in your life and pray for the needs of others. Ask him what he needs you to do for him today. Ask him to show you and he will, often in very unexpected ways. Offer yourself and your day to Him, asking for his strength to help you to do his will so that you are an instrument of his peace and healing in the world. PRAY daily! The second thing we can do to feed and hydrate our souls is to make an effort to go to Mass more than once a week! 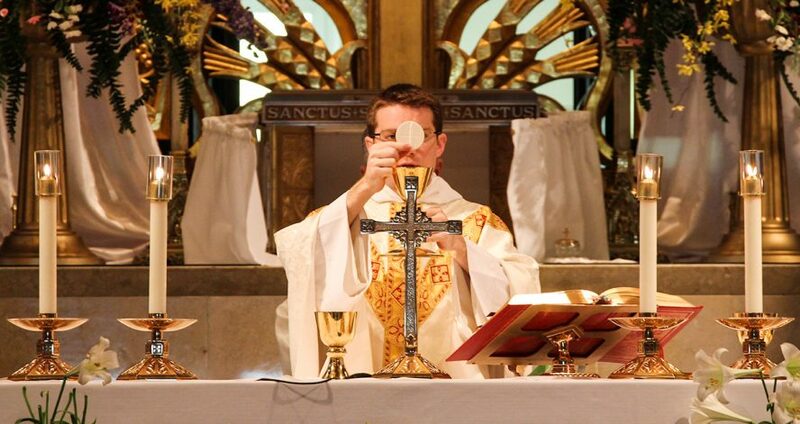 The Mass is the ultimate form of prayer and it’s where we receive the Bread of Life. There is no better food for your soul than receiving the Body and Blood of Christ more frequently! The Catechism tells us that receiving the Eucharist is the “Source and Summit” of the Christian life. There is NOTHING better you can do for the health of your soul than to attend Mass as often as possible. Until I made the commitment to attend daily Mass just a few years ago, I simply didn’t realize what I was missing. Now I can’t imagine starting my day any other way. I know that for many of us, attending Mass daily is simply not possible. I’m not trying to make you feel guilty if you aren’t able to do this. But if we put the Mustard Seed Principle to work and start small, perhaps attending one extra Mass during the week, God just might inspire you and help you find the time to go even more frequently. Why not give it a try for a month and see what happens? All you need to do is find a Mass at any church in town that fits into your schedule and go! It takes just 30 minutes of your time and it’s totally worth it! Try working it into your schedule once, or maybe even twice, during the week. Put it on your calendar. Why not give it a try and see where it takes you? My sisters and brothers, we must water and feed the seed of faith God planted within us at our baptism. By caring for this seed through faithful DAILY PRAYER and MORE FREQUENT RECEPTION OF THE EUCHARIST, we will surely bear good fruit to share with others. By making just a little more effort to grow closer to Jesus in our daily lives, though his grace we will surely become the Saint he has created us to be. Try putting the Mustard Seed Principle to work in your life by taking one or two small steps toward greater holiness and see for yourself how God will bless your humble efforts over time, growing within you a strong tree of faith with deep roots that bears much fruit. You’ll be amazed at what He will accomplish in your life with just a little bit more effort on your part.